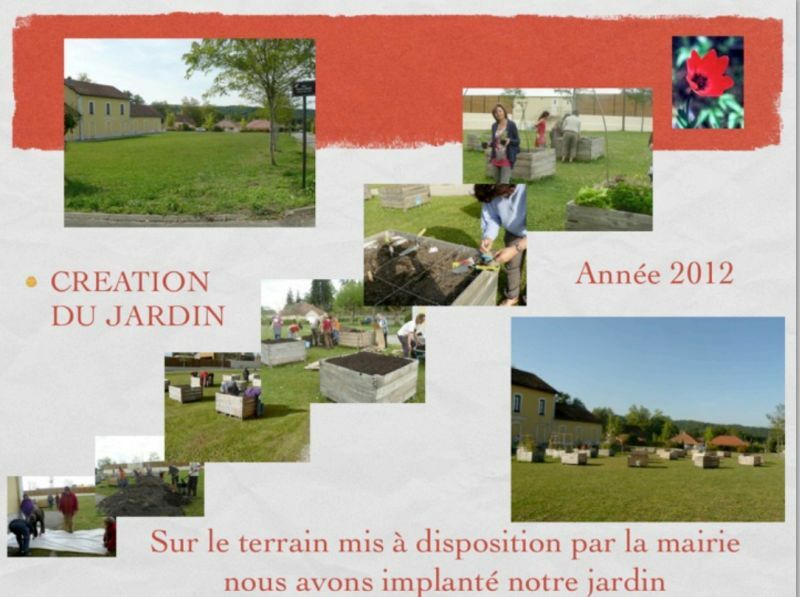 Casau Community Garden, Salies, France. The Salies en Transition group began through a series of meetings at the local bar where heritage varieties of seeds were exchanged. The group started holding a series of ‘trocs’, Seed Exchange fairs where people were invited to bring along heirloom varieties to exchange. They have now held 13 of these, where over 80 varieties of seed are distributed. People travel from a considerable distance to visit the exchange events. The names of plants are displayed in French, in Latin, and in Béarnais. People are encouraged to speak in Béarnais with older people who still speak it on hand to help out. 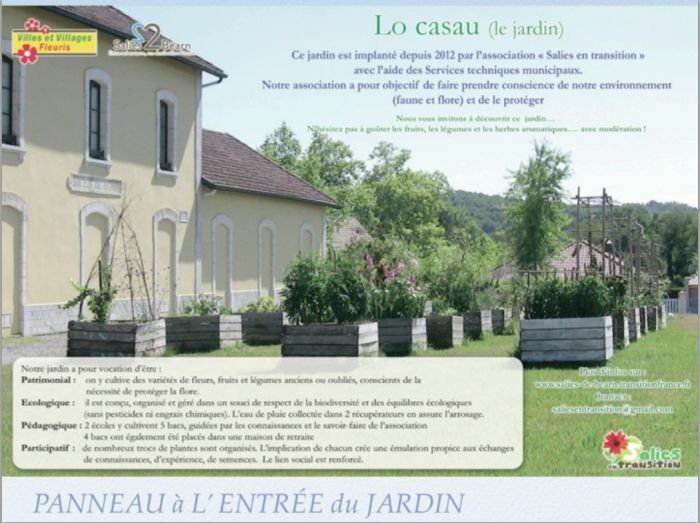 As well as the trocs, Salies en Transition has also created a garden “Lo Casau” in a 3000 square metre site of a former railway station, on land made available by the Mayor. They have placed 30 old wooden containers, given by a local organic kiwi producer, and grow a range of local and unusual varieties of fruit and vegetables. They use a technique called ‘lasagna gardening’, using layers of different mulching materials which is a great way of maintaining moisture in beds and making productive use of organic matter! They also have a 3,000 litre water tank. The water comes from the roof of the old railway station. 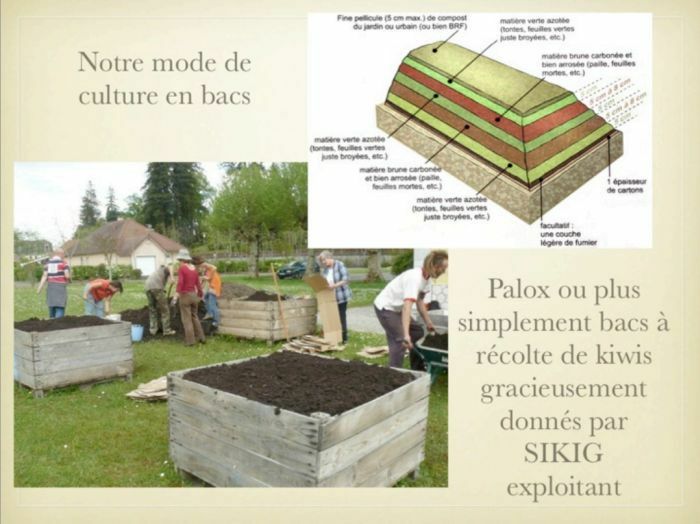 The group have created a PowerPoint presentation (in French) which captures some of their work. The garden makes use of organic methods, crop rotation and mulching. Four of the beds are cultivated by a local school for hyperactive children. A school that offers vocational training for young people with special needs also grows vegetables in the garden. Salies en Transition also placed 4 wooden containers at an elderly home, as therapeutic project. The garden is seen as modelling diversity: of plants, of generations, of needs and abilities, of languages. Diversity is important to Transition groups, one of the distinguishing features of resilience. Salies en Transition are the first group to connect the erosion of diversity in terms of seeds with the loss of indigenous languages. It is estimated that one language dies every 14 days, and that by 2100, nearly half of the 7,000 languages spoken in the world will have been lost. Following the French Revolution, regional languages were outlawed, with Parisian French being imposed nationally and Béarnais, related to the language d’Oc, was banned from schools. "When you use the knowledge of the citizens, then you can change the world".